This year was the first time I've been to the Clothes show, I have lived a sheltered life! And boy have I missed out! After an awful journey to Birmingham (first train was delayed which made me miss not only one connection, but three possible connections!!) I finally arrived at the NEC. Models Own is one of my favourite make-up brands, so I was really keen to get my hands on a goody bag. And I wasn't disappointed! The nail varnish I purchased myself, but the rest of the products came in the goody bag! I am really excited to try out these products, there is defiantly things I wouldn't necessarily buy so maybe I will be converted! I don't know if I've just been living in a cave, but I had never heard of Jelly Pong Pong before the Clothes Show. 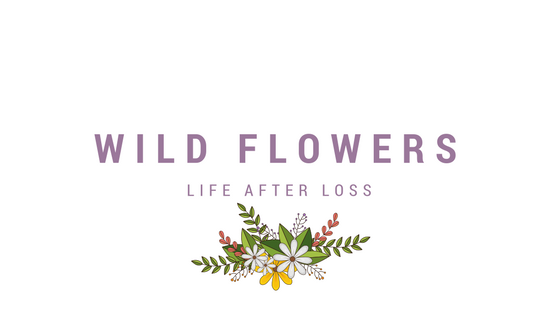 It turns out, their a make-up brand, that pride themselves in being animal and environmentally kind and friendly (so that can only be a good thing!) Their stand was manic it was possibly the busiest in the beauty section, so of course I felt as if I was missing out if I didn't go get a goody bag! It was two bags for £5 so this is what I received..
1,2. First is an eye brightening kit, which comes with a handy tweezers and eyebrow brush set. 3. Lip and Cheek stain. This is a really strange consistency, it comes in a hard block but comes off quite watery. It does smells delicious though! 4,5. Another lip and cheek tint. Two colours to play around with. 6, 7, 8. Bronzing kit. This does seem a little dark for me (maybe it will be used when I'm going out to Christmas Parties!) But I LOVE the cute flower puff! I don't feel these purchases need explaining, because they are all beautiful! We eventually made it to the show, and saw TOWIE stars, The Risk, Hollyoaks characters, George Lamb and of course the gorgeous Jade from BNTM. 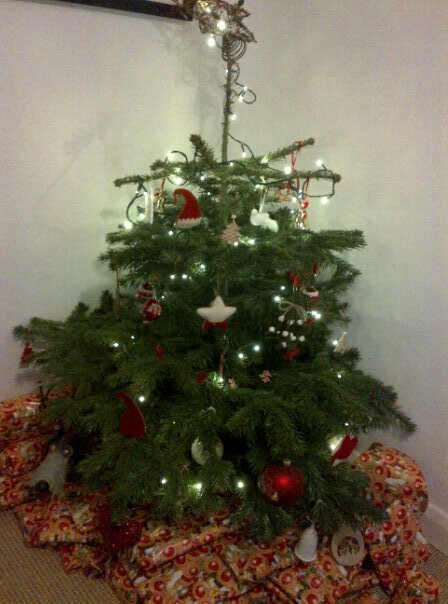 I'm all ready counting down to next year.. Apologies again for going AWOL, I just have soo much going on at the minute! I've been working alot - 6am starts, so when I get home all I want to do is crash! 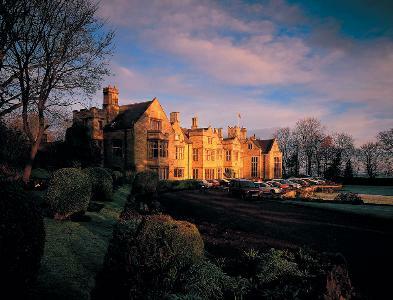 Redworth Hall in County Durham, how Christmassy? I'm not actually sure what this post was about, just a reminder that I am still alive! 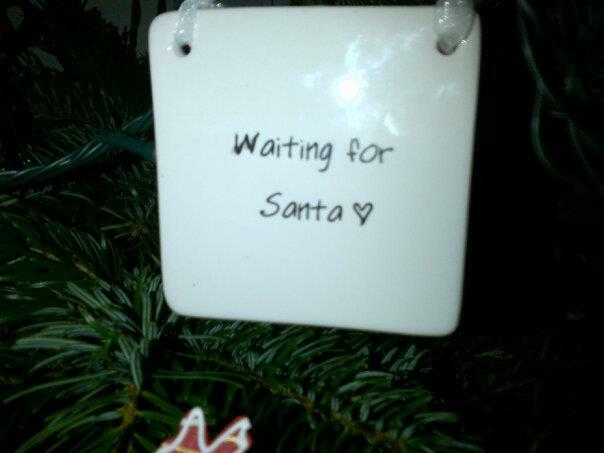 I am going to make a Christmas wish list, and let you all know what is on it..
How do you get in the Christmas spirit? Is anyone else off to the Clothes Show this weekend? Apologies for the lack of blogging. I've just moved house AGAIN, and have been without the Internet for 10 days. On the upside I found my camera charger in the move so I am able to upload photos finally! If you ask me Christmas is all about the glitter and glam. 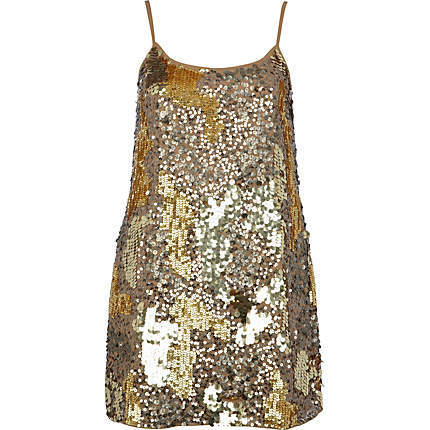 There are some amazing pieces in the shops at the moment, I defiantly need a sequin fix this winter! I'm not a huge fan of River Island but they have really upped their game recently. I am in LOVE with the first dress..the website states it to be a cami but as I'm a petite 5"2 it would be a dress on me! I am so into embellishment and beading, I have a gorgeous skirt from Topshop maybe 3 years ago that is covered in sequins. It is so heavy and well made I will never throw it out. I purchased these beauties yesterday. I have very little money left before pay day, but I HAD to buy them. They will go with so many outfits and are perfect for Winter. Plus they were reduced by 50% to £14.99! I will defiantly be getting my moneys worth! 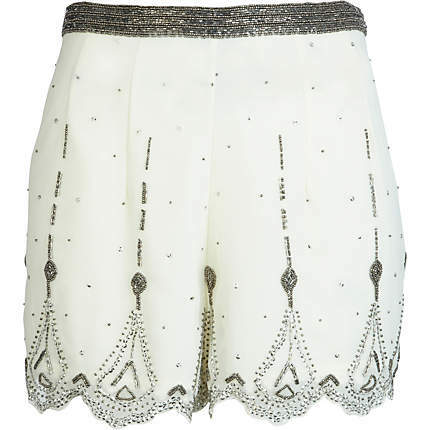 These reminded me a lot of some I saw in Topshop earlier this year, but for a fraction of the price! 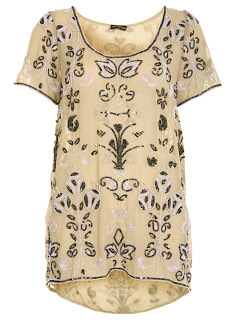 Again Miss Selfridge isn't usually my go-to shop, but they also have some really great things in this season. I love the "Designed By" collection they have just launched, which the first item is from! I have only seen this top on their website so I can't wait to try it on in real-life! I love these tights too. Ever since I was flicking through magazine and saw a model wearing tights like these with an over-sized tunic, I have wanted a pair, I will defiantly be purchasing these.. So you can see my obsession with over embellishment, I just love the time and care taken to make these items. And you know once you have them in your wardrobe they will never not be in your life! What is your Winter staple going to be? Yesterday I plucked up the courage to go Blonder than Blonde! My roots were getting a little out of hand, and every time I go to the hairdressers, I am never satisfied with the results. So I took measures into my own hands...and surprisingly it went quite well. My natural colour is a light brown, mousey shade which I dislike and describe as a non-colour. So before my wedding in July, I went for some highlights to liven my colour up a little.. then the addiction began. Everyone commented on how nice my hair looked now that i had gone lighter, so I continued getting highlights done. 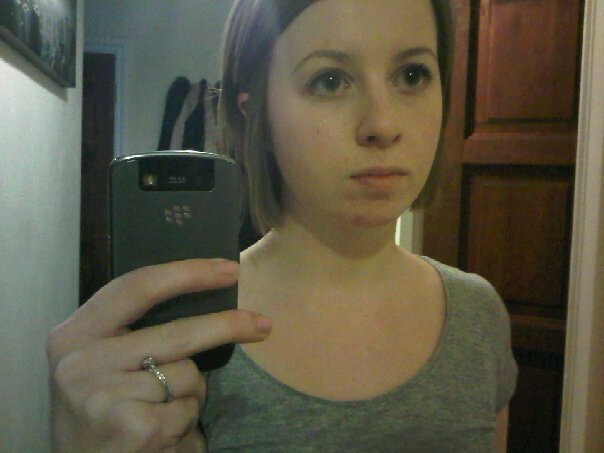 Due to my lack of funds, I could only ever afford half a head leaving the rest of my hair a dull brown. 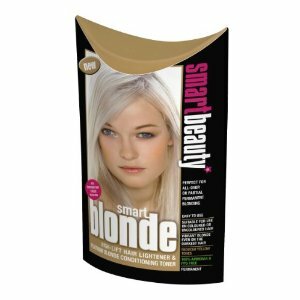 While I was in Superdrug yesterday I picked up Smart Beauty Hair Dye in Platinum Blonde.. It was fairly easy to mix, you get two lots of powder and two sachets of liquid to mix together (it comes with a mixing brush, however you need to use your own bowl). Once its mixed you can begin (obviously after you have followed the skin and allergy tests!!). As my hair was quite dark underneath, I was a little concerned about what colour it would come out as. I left the product on for around 40minutes - maximum time is 60. 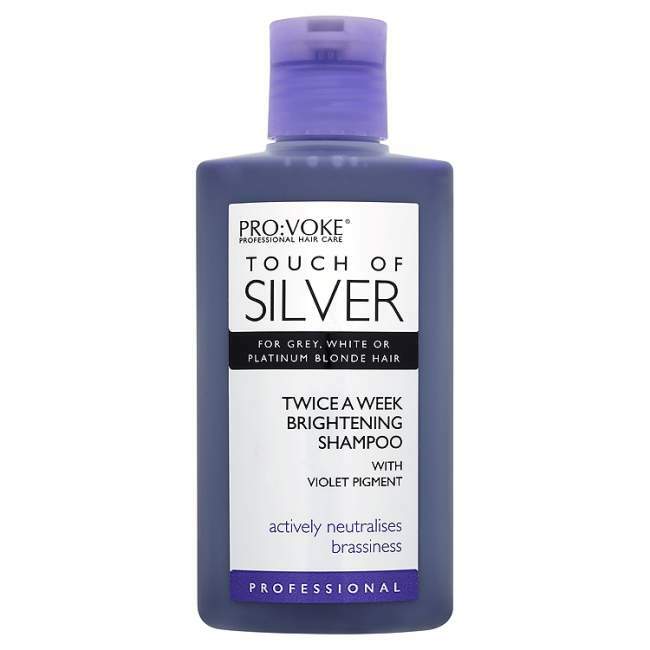 When I first washed my hair it was bright orange, however then I used the handy toner that comes with this product and the colour evened out. 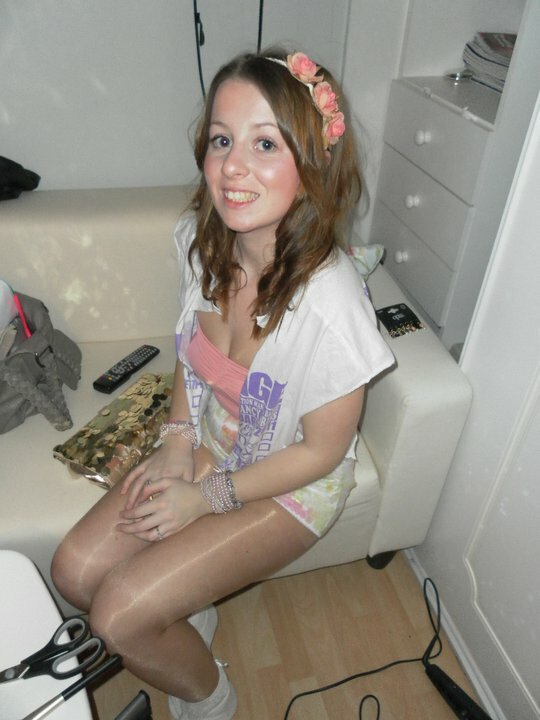 There are still some different shades in my hair, but this was to be expected as it was different shades before I began. 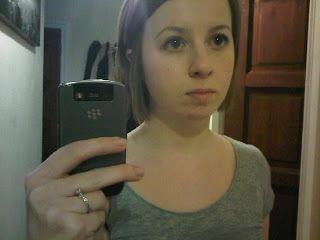 Excuse the bad quality photo, moody face and crazy make up patches (it doesn't look like that in real life!). But this is my bright blonde...get your sunglasses at the ready! Any tips on how to keep my colour vibrant? So far, so good. I didn't expect huge changes overnight, but I've been using this for just under two weeks and the oiliness defiantly has improved. My make up is staying in place for longer rather than gathering around the bottom of my nose! Living close to Manchester is God-send, my favourite shop HAS to be Selfridges. Its not often I buy anything but there is something very special about walking around this shop - even if I can't afford the £1250 Mulberry bag I'm after! And now the store in Manchester has been made even better, by opening a full brand new floor just dedicated to beauty. 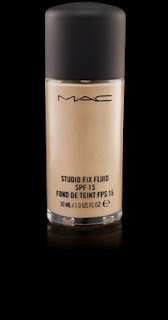 After much research online my trusted brands for a new foundation were Nars, MAC and Bobbi Brown. Thankfully all these brands are in one place - Selfridges. Firstly I spoke to a lady at the Nars counter. She new which colour I was to go for immediately, and gave me a small sample of the foundation and a primer (which is very good). However, I didn't really feel she had the time to talk to me and discuss my needs. This gives great coverage, it is a warm colour and gives me a healthy glow. What I like most is you can layer the foundation without it looking cakey, and build up in areas you think you need it most. I have only been using this for 5 days but so far its a winner. Any tips for oily, acne-prone skin? For the past week I have been noting down everything I want when pay day arrives, thankfully that day in tomorrow! So I need to stock up on the usual - toiletries, new make-up (which will be reviewed), clothes, but most of all I want a winter coat. It want a hood - This may not be the coolest of things but I prefer a hood, however for the right coat I am willing to give up this luxury! It needs to have a zip rather than buttons (or both!) - I find this keeps more warmth in. I need a neutral colour so it is versatile - cream, camel, khaki, black or brown. It must not drown me! !- I am only 5 "2 and have a petite frame, I love knee length coats but most are designed for taller people than myself! 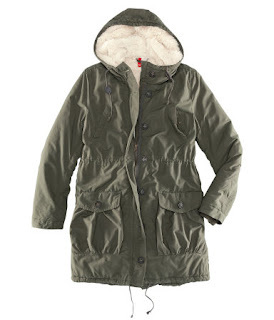 I even purchased an Age 13 coat last winter to accommodate my size! The Parker - The ultimate coat. This is back on trend and unbelievably versatile. This can be literally thrown on with a chunky knit scarf or worn with some killer heels. I love the colour of this coat and at only £39.99 from H&M it's a steal! Animal print - It seems like every year this trend comes back for winter. 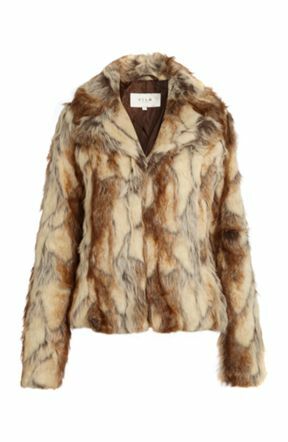 Fur is HUGE on the catwalk and this coat incorporates two of this winters biggest fashions. The only thing that puts me off is the lack of shape to this coat but I'm sure it would look completely different when its on. £70 Topshop. Fur - There is something about fur that draws me in every time (fake not real, of course!). Again this is so on trend at the moment and would look amazing glammed up or dressed down. The big but for me is when the fur gets damp or wet it destroys the whole look of the coat and leaves it matted. I know 'you shouldn't wear it if it's raining' but come on I want an all rounder plus I live in the UK, if it didn't get worn in the rain or snow it wouldn't leave my wardrobe. 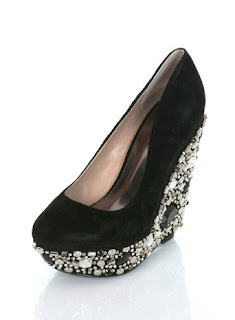 Vila at House of Fraser - £85. Now this is my guilty pleasure, it maybe doesn't cover some of my criteria (if any), but it looks amazing...on the website that is, I haven't got round to trying on! 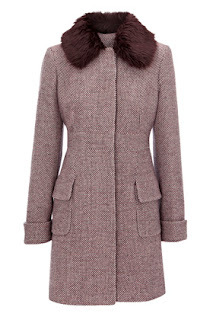 I love the subtle dusty pink colour that is so feminine, and the fur collar adds sophistication. 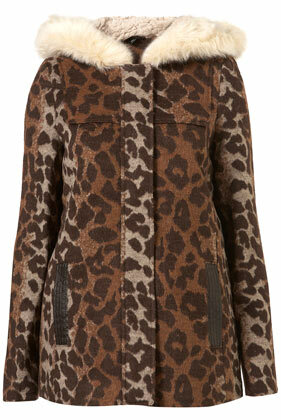 This also has been reduced form £110 to just £80 - not bad for a coat that will never go out of fashion! Fingers crossed at least some of these coats will be available in the store for me to try on tomorrow, I will keep you posted and let you know which coat I go for! Do you have any coat style tips for petite girlies? Over the last year I have been trying to get the red/copper tones out of my hair. 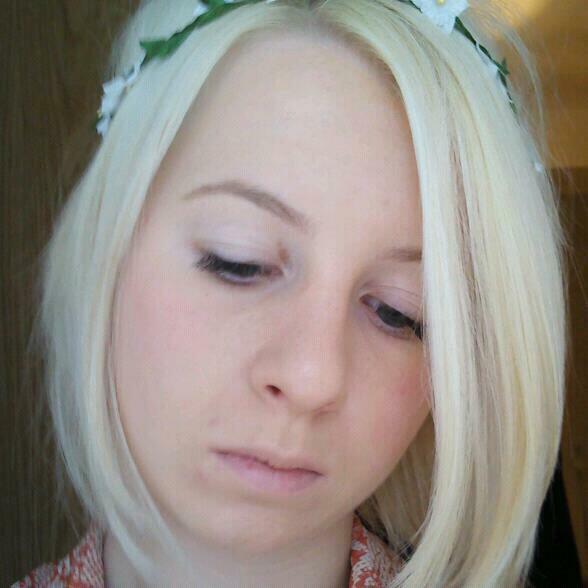 Getting rid of red hair dye is a NIGHTMARE, so earlier this year when my roots were shoulder length (ergh!) I got the chop! It was a relief to have my natural colour back, and nice for a change, but I like to change my mind A LOT. After realising my hair wouldn't grow back in the next 24 hours, I dealt with the situation and lived my boring hair for 2 months... desperatly needing a change I got some highlights. There is something addictive, for me, about changing the colour of your hair, if I go dark, I go really dark/black. But in this case I was going lighter gradually (so not to ruin my hair). So obviously now I want whiter than white blonde hair! I'm sure a lot of you have discovered the yellow-tinge when highlighting Brown or dark hair, and I was desperate for something to tone my colour after the hairdressers. I searched for reviews on toning shampoos and came across this.. This had 5 stars on the reviews and at only £3.69 a bottle, I was willing to give it a try! And I love it! As you can see it is only to be used twice a week, following the instructions you lather on like a normal shampoo then leave for five minutes whilst it works its magic. Not expecting drastic results after the first wash, I dried my hair to discover the brassy yellowing had gone to leave a more ash-y tone. I have used this twice so far and had a number of compliments and a few "have you had your hair done?'s". (sorry about the lack of photos, it will get sorted soon). Not only this but it smells delicious, kinda like sherbet. So now I feel confident to go lighter and know it won't result in yellow hair! 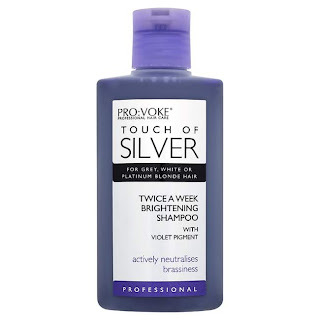 This is a must for those with white/grey or light blonde hair..plus it will last forever, a little goes a long, long way! Do you use any 'hidden gems' to calm your colour? Everyday I log onto Blogger for my daily fashion/beauty fix. There are so many amazing blogs out there that really do inspire readers to try or do new things! I love reading about the latest must-haves and I am a huge sucker for a new product to try or the latest clothing trends, and I just wanted to share my opinions with those who want to hear. 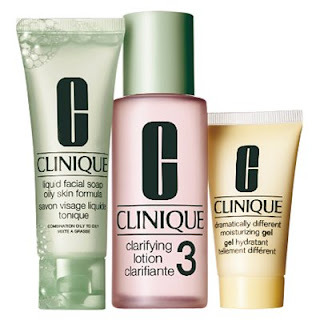 This blog is going to be a place for my beauty reviews, products to try (or not to try!) and basically what I spend my hard earned wages on! 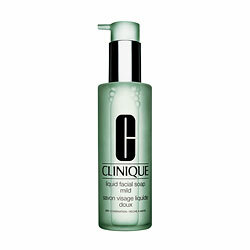 Last week I purchased this from Boots (advantage card points!!) for £9.99. I have a really pale complexion so I bought the Light but it does also come in a slightly darker shade. So firstly the texture is smooth and leaves your skin soft after use, and it smells amazing! I feel this is would be a fab alternative to foundation in the summer. However there are a few down sides, I found that it left my face quiet shiny (I had read that other users had used a powder over the top to give a more matte effect). I love the dewy look, and it is back again this season, but there is dewy - then there's greasy! 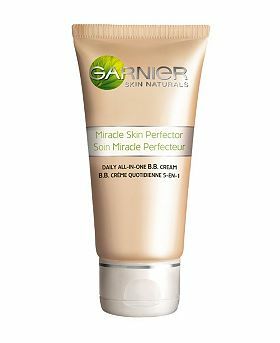 After discovering this I experimented with using the cream as a base for my foundation, this is perfect as a primer and quickly replaced my No7 colour calming primer.This really helps to keep my make-up in place all day, even when I'm up at 5:15am. 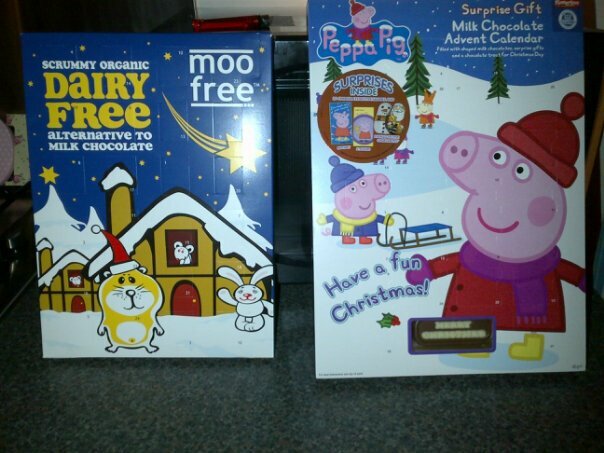 I will defiantly be purchasing again.